The Penguins have been hoping to overtake the Islanders and/or Rangers in the Metropolitan Division to improve their playoff seeding. Now, they'll be hoping they can fight to save their playoff lives as Evgeni Malkin will miss the next 6-8 weeks with an undisclosed upper body injury. The Penguins had struggled earlier in the season when Malkin missed 10 games with a lower body injury, and the hopes were that Malkin's return, along with the rest of the forward depth, would help propel the team back up the standings. With a month to go before the playoffs start, the Penguins will be in a bitter fight just to make the postseason. Malkin was injured in behind the net collision during last night's game against the Columbus Blue Jackets when Dalton Prout checked Malkin in the board. It seemed like an innocuous hit, but Malkin seemed to have hurt his left hand or wrist on the play. He managed to return to assist on Carl Haglin's game winning goal, but he left the game immediately after and did not return. 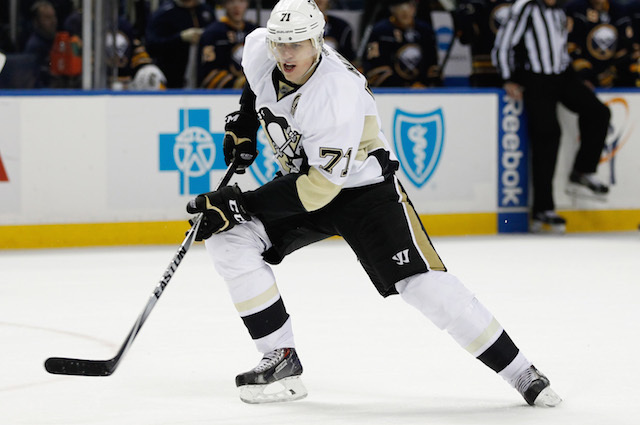 Without Malkin, the Penguins will have a serious hole in the lineup to plug. It's unknown whether the team will go back to Matt Cullen centering the 2nd line as they did earlier in the season or if they'll continue with Nick Bonino as they did last night. The Penguins are currently sitting in the second wild card spot in the Eastern Conference with 78 points. They're one point behind the Detroit Red Wings with a game in hand, and they sit 3 points ahead of the Philadelphia Flyers with an additional game played. If the Penguins make the playoffs, they'll likely need to win at least one round if they hope to have Malkin back before the end of the year. It becomes even more imperative that the Penguins finish as the first wild card, as they'll likely need to face off against the Atlantic Division to have a chance to last until Malkin is able to return to the lineup.